Apple’s Newsstand application for iPad and iPhone is a great idea. It provides automatic downloads of digital newspapers and magazines. This is a brilliant way of reading content on the go – it’s a lot easier to take the digital edition of the Sunday Times on flight or train than the hefty print version. And the Guardian iPad edition is beautiful as I blogged a year ago. But in my experience Newsstand is very unreliable. Automatic downloads often don’t happen, leaving me without the latest edition – or frantically downloading it before leaving the house. I found a new glitch today. While I watched Owen playing in the London Transport Museum, I opened today’s Sunday Times – only to find this infuriating ‘computer says no’ message. I had to log into iTunes to read content I had downloaded and opened earlier today. Luckily I had internet access – if I’d been on a plane I’d have screamed at my iPad. Can you imagine a print newspaper failing to open? Scott Forstall, the executive in charge of Apple’s iOS software (the software that powers the iPad and iPhone) lost his job this week for the iOS 6 Maps fiasco. The Maps and Newsstand experiences suggest Apple is far too quick to release software before it has been properly tested. This entry was posted in Media, Tech and tagged Apple, Apple Newsstand, Scott Forstall by Rob Skinner. Bookmark the permalink. I totally agree, I have the times and have found all the problems you describe. 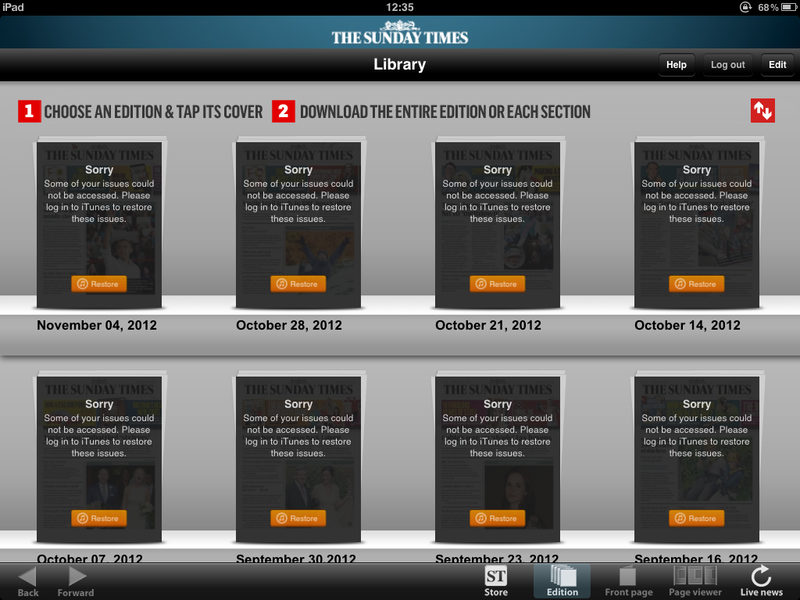 Mind you I thought it was just the times fault rather than the iPad newstand. Caroline – glad it’s not just me! And it’s not just the Sunday Times: The Guardian is exactly the same.